The Syrup room equipment is designed to blend and mix liquid syrup components including liquid sugar, glucose, additional sweeteners, water and other syrup components. It is also capable of blending and mixing still fruit containing beverages. Once blended the product is automatically delivered to the consuming equipment under temperature adjustable conditions as required. The equipment has been designed as an ejector mixer of liquids which have a viscosity not exceeding 500 cP. It consists of two free pressure tanks with separate pipework which then join to a common flow distributing plate. Each tank is fitted with a gentle mixing jet and ejector, a variable speed centrifugal pump and independent CIP pipework. Produces very high quality syrups and beverages then delivers them smoothly and gently to the consuming technology. No manual operation necessary apart from changing the flowplate and choosing the procedure on the operator panel. Procedures are fully automatic and are simple and easy to change. Level heights including volume calculations are continuously measured and checked. The intensive ejector and agitating speed are automatically adjusted according to the tank level. The product is delivered via a variable speed driven pump adjusted to the desired discharge pressure. For sedimenting products there is a choice of automatic agitation. Machines include a fully automatic CIP procedure requiring a low volume of cleaning agent. Once used one tank can undergo the CIP procedure while the second tank is in use for production. Includes an Allen-Bradley PLC control system with an easy to operate 3” panel. Communication is enabled for up to six other pieces of equipment as standard (e.g. 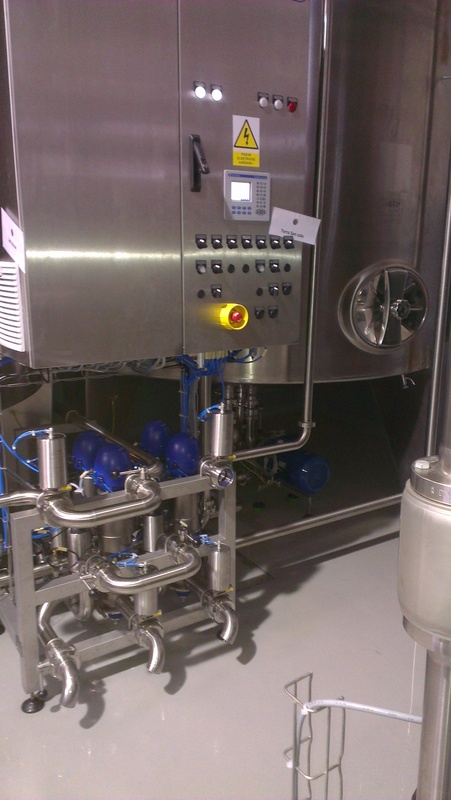 mixer, filler, pasteurizer and other tanks) as well as the CIP unit. Machines are easy to maintain with the minimum number of moving parts and no propeller agitators. If required an optional function which purges the delivery pipe during quit mode using low pressure CO2 can be included. 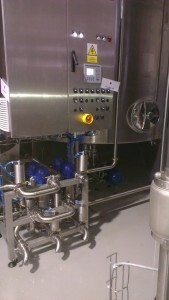 It is the ideal machine to work with the syrup components preparation and dosing centre model doser VARIO.